Remember that game “Hot Lava” that you used to play as a child? It would be real fun and challenging to play the game at Hawaii Volcanoes National Park, because here you don’t have to pretend the floor is lava. The ground actually is lava. At the Hawaii Volcanoes National Park on the "Big Island" of Hawaii, you can watch the landscape change before your very eyes, thanks to Kilauea volcano, one of the most active volcanoes on earth. 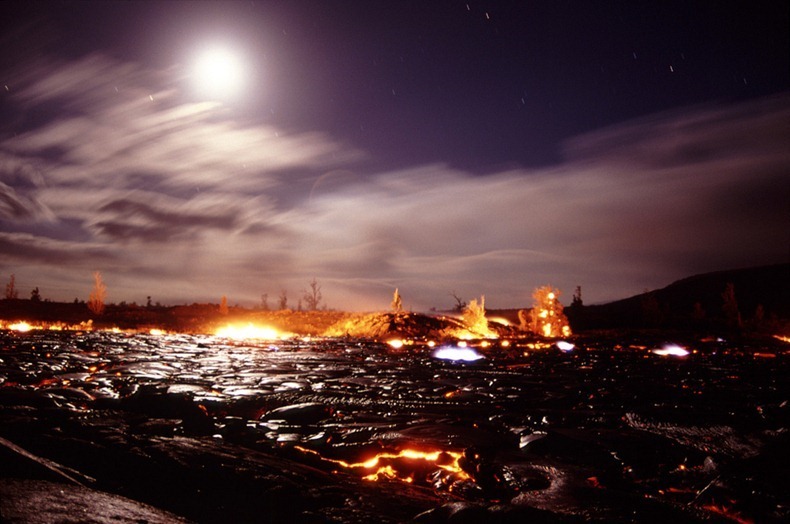 The park is also home to Mauna Loa, the world's most massive volcano. The park offers dramatic volcanic landscapes, flowing rivers of hot, molten lava as well as glimpses of rare flora and fauna. The chance to witness the primal process of creation and destruction make this park one of the most popular visitor attraction in Hawaii and a sacred place for Native Hawaiians. Founded in 1916, the Park encompasses 333,000 acres from the summit of Maunaloa to the sea. Over half of the park is designated the Hawaii Volcanoes Wilderness area and provides unusual hiking and camping opportunities. Here you'll find 150 miles of hiking trails through volcanic craters, scalded deserts and rainforests as well as a museum, petroglyphs, a walk-in lava tube and two active volcanoes: Maunaloa, which last erupted in 1984 and Kilauea which has been erupting since January 3rd, 1983.